Here are the weekly trends (a day early, since I'll post the final trends in 3 days anyway). 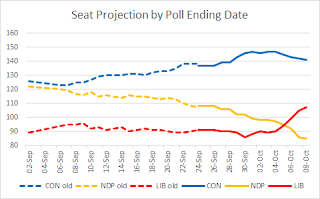 After flirting with the 150-seat level in the first few days of October, the Tories started pulling back last week, and their decline accelerated this week. Meanwhile, the Liberals have continued their steep ascent. 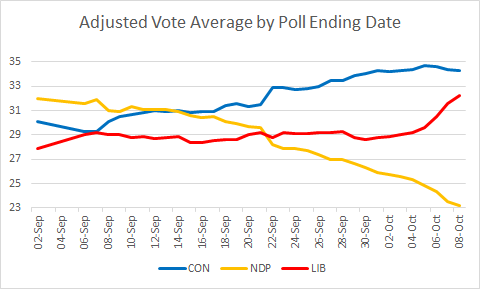 Note that the only polls ending on Oct. 13 and 14 are the rolling EKOS and Nanos polls, so it is too early to say that the Conservative fall and/or the Liberal rise have stopped. 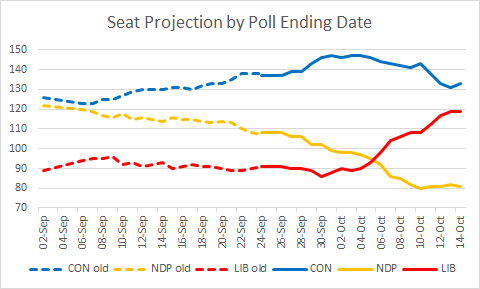 The NDP, however, has been essentially flat for five days, so it appears that it has settled around 80 seats. In Québec, the NDP stopped its slide just before disaster: with a current poll average just under 30%, it still stands to win roughly half of the seats in Québec. However, Quebecers may not have said their last word yet. Today's EKOS poll shows that the Liberal lead has shrunk from 4.2 points to 0.9 points. In ON, the Liberal lead is 10.7; that's a healthy lead, but not the 18.1 from yesterday. The NDP maintained a good level in Québec (34%), but lost its very temporary lead in BC; overall, it gave back 1/3 of its gains from yesterday, suggesting that it has not started a surge. With these numbers, we're talking a 30-35% chance of the Liberals being in the lead. This is essentially the opposite of the adjusted projection: 30-35% chance of a Conservative lead. I'm guessing that starting tomorrow, we should get an avalanche of various pollsters' final polls. 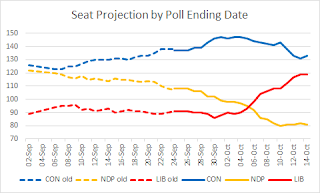 If all firms that have published a national poll during the campaign decide to have a final say, we'll get 8 national polls (Abacus, Angus Reid, Environics, Forum, Innovative, Ipsos, Léger, Mainstreet) on top of the daily Nanos and EKOS surveys. We may also get provincial/regional polls from CRA (Atlantic), CROP (Québec) and Insights West (BC, Alberta). I will post trends this evening to provide a good idea of how we got to where we are now. Tomorrow, Saturday and Sunday, I will do the standard two updates each day. There will be an additional final update late Sunday night / wee hours of Monday, and hopefully (if I'm not too tired by that point) some analysis posts (trends, strategic voting, things to watch for election night) throughout Election Day. I also hope to provide an interim projection around 9:00-9:15pm ET based on Atlantic results, just before polls close in most of the country. So stay tuned for some exciting days! Today's Nanos mostly shows stability, meaning that numbers on Oct. 13 were similar to those on Oct. 9. But Oct. 9 was the day that produced a large drop in Conservative support, and some were wondering if that was a blip due to people having left home for the holiday weekend Friday night. It now looks like that wasn't a blip. On these numbers, the Liberals have roughly a 60% chance of being ahead. - For those of you interested in strategic voting (polls suggest ~30% of you are), see my guide for the advanced polls. It was written Thursday night, and does not take into account polls released subsequently. Another day, another good poll for the Liberals. This time it's the most recent Forum poll, where the Liberals are up 2 and the NDP is down 3 since three days ago. Other than the Atlantic results, this poll is stellar for the Liberals across the board: a 4-point lead over the NDP in QC, a 15-point(!) lead in ON, and a high number of 32% across Western Canada. Nanos has the Tories back up to a more respectable 33% in ON, which is still well back of the Liberals at 42%. What Forum and Nanos both suggest is that the Liberals were doing better late in the week than early in the week. We'll find out this afternoon if EKOS saw the same thing. Late last week, the Conservatives appeared to be running away with the election. 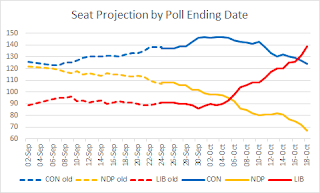 Now, the Liberals are duking it out with the Tories for the popular vote lead, and if the current trends continue, by the end of next week, they will be fighting for the seat count lead. However, if the NDP is approaching its floor in Ontario, the next 20 seats may be tougher for the Liberals to gain than the 20 it gained this week. The Liberal vote share ranges from 31% to 35%. 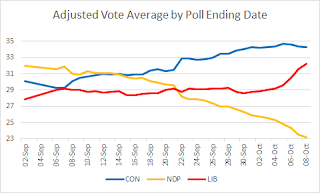 However, the 32% results occurred early in the week, and the five of the six most recent polls are within a very narrow range of 33.8% to 35%, with Angus Reid being the outlier at 31%. 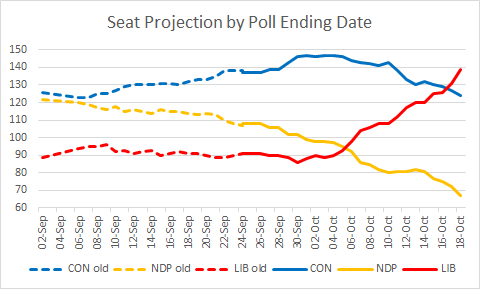 The last unadjusted projection (issued before Angus Reid) pegged the Liberals at 33.1%, meaning that if their late-week numbers are sustained, the Liberals will keep gaining in the projection. The Conservative vote share ranges from 30% to 33.7%, with Mainstreet putting it at 36%. The last unadjusted projection placed it at 32.6%. It looks like the Conservative vote is quite stable at this point. The NDP vote share ranges from 24% to 26% in six polls, while Mainstreet and EKOS peg it at 20%. 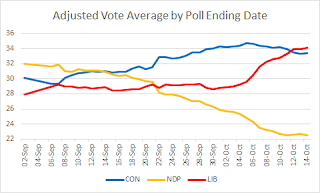 The last unadjusted NDP poll average was 23.9%. It will be interesting to see if its slide has stopped, as the Nanos tracking suggests, or if it is still ongoing, as the EKOS tracking suggests. 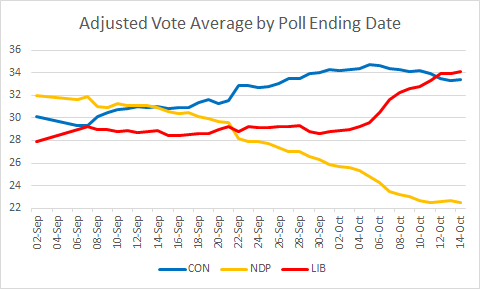 We can see that during almost all of September, NDP losses appeared to go to the Tories. Most likely some of it actually went to the Liberals, who probably lost some centre-right voters to the Conservatives. 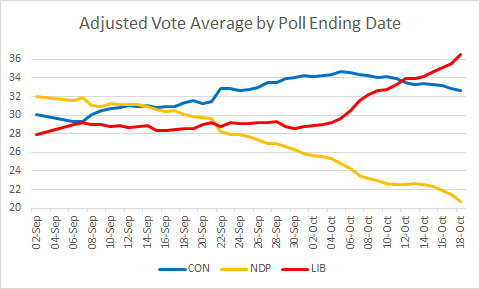 However, in the past 7 days, the Liberals gained 3.4 points thanks to a 2.7-point drop in NDP support (and a 0.6-point drop in Green support). The most obvious explanation - and likely the right one, though we can only speculate - is that these were "change" electors deciding that Trudeau is more likely than Mulcair to replace Harper. The dotted lines refer to projections made before the inclusion of riding polls and sub-regional breakdowns. I will write a post in the coming week about where these probability estimates come from. I believe that some of the other ones out there overstate the precision of seat projections, but The Globe's Election Forecast gets reasonable results (it shows a higher Liberal probability of winning because it does not include a turnout adjustment). - Atlantic: The Liberal vote share is roughly double the (very similar) NDP and Conservative support levels. It is difficult to know how things are distributed by province, but whatever happens, the Liberals should win 20-27 out of 32 seats here. - Québec: A complete mess. The Bloc usually has problems with turnout, so it will have trouble coming out on top of this four-way race. The NDP probably still has a small edge over the Liberals, but don't be surprised if it goes away completely. The wild card is the Tories: are they at 17-23%, as phone/online polls suggest, or 23-27% as IVR polls suggest? Commentator Jean Lapierre believes that some Conservative supporters in Québec feel ashamed to admit that they will vote Tory, so perhaps the IVR polls are more correct. My adjusted average currently shows NDP 29%, LIB 25%, CON 24%, BQ 19%. 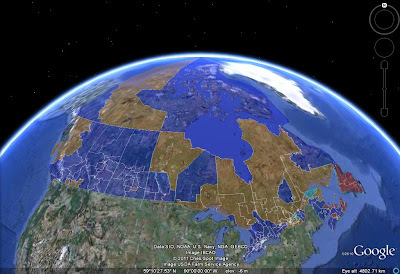 No regional breakdown has been offered in Québec for several weeks. However, Jean-Marc Léger says that the NDP is 2nd everywhere: in Montréal to the Liberals, in Quebec City to the Tories, and in the countryside to the Bloc. If that is borne out, the current NDP projected seat count of 41 would be a gross overestimate, and the Bloc might regain official party status. Unanimous agreement: if everyone turns out, Ontario is currently red. (Well, Angus Reid shows a tie, but Angus Reid has been low on the Liberals in ON throughout the campaign.) The Liberals were at 37-39% early in the week. Have they increased to the low 40s? This is THE question for the next few days. If so, they have a real chance of winning the election. But if they remain in the high 30s, it probably won't be enough. My adjusted average is currently skeptical, showing LIB 38%, CON 37%, NDP 20%. Look for a continued Liberal surge in the projection if today's Mainstreet, Innovative and Nanos numbers hold. - MB/SK: Roughly speaking, these are to the Tories what the Atlantic provinces are to the Liberals. The bulk of tight races are Conservative/NDP ones in Regina and Saskatoon. The Liberals should get a healthy delegation from Winnipeg. - AB: The NDP has dropped dramatically here, from 25-30% in late August to around 15% now. Proportionally, this is as dramatic a decline as it suffered in Québec! Some of the vote went back to the Tories, while some went to the Liberals, who are now above 20% in most polls. 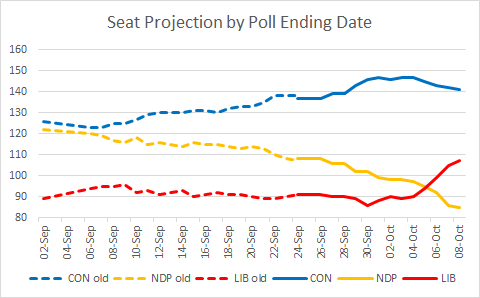 The current projection probably overestimates the Conservative seat count here: there's noise from insider pollsters that the Liberals are, in fact, poised to make gains, but there are no publicly available hard numbers showing that. Riding polls in the last week of the campaign may provide some clarity. 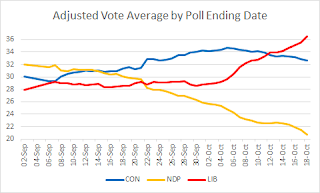 - BC: It's a three-way tie in the unadjusted numbers here, giving the Tories a marginal lead in the adjusted average: CON 32%, NDP 29%, LIB 29%. The Liberal vote is inefficient to the extreme here: it is very concentrated in a small number of ridings, which leaves most other ridings around 20-25%, not enough to win. As a result, the Liberals are stuck at 7 projected seats despite battling for first place in the vote share. The Greens remain stuck at 9-10%, though what we really need to figure out if they can win a second seat is a riding poll in Victoria - none has yet been publicly released.